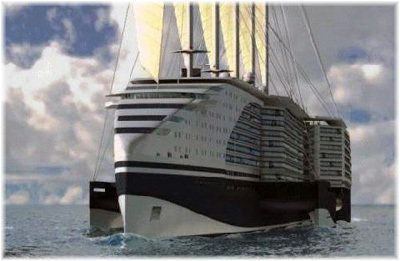 Today, we look at a novel LNG-powered sail-assisted pentamaran cruise ship design from STX Europe, which would bring several new (and old) ideas to the world of cruising: long promenade decks with balcony cabins off, forward-facing lounges, solar panels, split after superstructure and sail power among them. CLIA’s recently released figures reveal that the North American cruise market recovered quite well in 2010, with growth of 10%. In Canada and the US Pacific Northwest, the cruise associations look at the potential effect of the new North American ECA – to take effect in less than a year, it could cost them up to 390,000 cruise passengers. And on the West Coast, we look at progress in Vancouver and new itineraries from Disney. In the last few years, we’ve been deluged with all kinds of news about Oasis and Allure of the Seas, Norwegian Epic and other gargantuan cruise ships that seem to many to be developing into some sort of new product that is not really related to traditional cruising and no longer takes into account why some people want to go to sea. But now, from STX Europe, makers of the ugly duckling Norwegian Epic, comes a new idea (several new ideas in fact) for cruising. Two weeks ago, in “Cruise Ship Design: The Good, The Bad and The Ugly,” we went over some general themes in the design of cruise ships. But the Eoseas, as she is called, would be a ship that incorporates a lot of traditional maritime themes while at the same time being very 21st Century. Although revealed two and a half years ago and reported on in March 2009 by the French web site Mer et Marine, the concept did not enjoy much of a welcome at the time, with most reactions tinged with doubt about the viability of such a ship. But eleven days ago, the Australian technology web site ZDNet covered the design again in its Travel Tech section and this seems to have provoked a more positive response last Tuesday from the Maritime Propulsion web site. The Eoseas is a vessel that will serve modern environmental requirements while simultaneously harking back to the days when Allan Villiers wrote about sailing ships and worked on preserving the Cutty Sark and other clipper ships. More prosaically, perhaps, sails in the air would allow those who burn in the sun to find some shade on the top deck. The ship’s double hull design, meanwhile, would provide a source of natural ventilation, through the use of long promenade decks on either side of the ship that would evoke the days of the great ocean liners. The promenade decks would not do away with balconies, as cabin balconies would open out onto them, rather than the side of the ship as at present. And, judging by the design outline and the way she bulges out aft, she would have plenty of opportunity for forward-facing lounges. Finally, she would use half as much fuel, generate significantly fewer emissions, exploit the use of solar power and use modern methods of recycling. Built in trimaran style over five hulls, with two of which on either side in the same fore-and-aft plane, with lifeboat tenders in between, the dimensions of the resulting pentamaran would be 305 x 60 metres (about 1,000 x 196 feet). This beam would prevent her from ever passing through the new 55-metre wide Panama Canal locks, even if she could stow her tall masts. Her 105,000 tons would provide space for 1,403 passenger cabins, giving her a double occupancy capacity of 2,806 passengers, or 3,311 if all berths were filled. Her passenger space ratio would thus vary between 31.7 when full and 37.4 based on lower berths only. Soon after the design concept was announced, however, Mer et Marine found that it attracted a lot criticism from those that read about it, or at least those they consulted, and serious doubts about whether such a ship would be saleable. Some, thinking that people would still want their privacy, were doubtful about the remaining balconies opening on to the promenades. 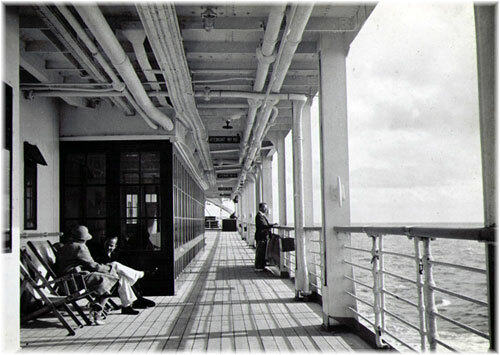 In truth, however, long promenade decks were once a social feature of the great ocean liners, while today’s balconies tend to isolate passengers from one another. The idea as proposed with Eoseas would still leave a private area for the cabin’s residents, something that is lacking, fro example, on the Lanai cabins on Holland America Line, where one steps directly from the cabin onto the promenade deck. Having both a public promenade and private balcony areas could actually return a sense of community to the decks, not unlike the atmosphere found at certain plush seaside resorts, where neighbours can choose whether they want get to know one another or not. It might also bring an end to the balcony-to-balcony shouting that one occasionally sees – and hears. It should be said though that with a 60-metre beam, the promenade decks could be a lot wider than portrayed in the STX concept drawings. And there still remains the problem that direct sun would not shine onto the balcony, in which case occupants would have to move their sun loungers to the side of the ship. Even then there would be the problem of solar panels being in the way. So not necessarily an ideal solution unless one goes to the open decks. Other critics doubted that there would be enough open deck space for those who do like the sun, but not everyone wants to lie or sit in the open sun all day and for these people the sails would be welcome. Not only that, but the 60-metre beam would give a much larger sheltered after deck area than even the Oasis of the Seas, and with the divided superstructure aft, there is the tremendous opportunity of having two sets of traditional tiered decks, one on each side of the ship. The ship’s dimensions generated further criticisms. The 100-metre high masts would prevent her from entering any port with a bridge, such as San Francisco or New York, to name just two, and she would not be able to pass into the Baltic now that a bridge crosses over the entrance. Neither would she be able to pass through the Suez Canal, where there has also been a bridge crossing for more than a decade. Should a potential owner wish to do away with the sails, however, there would still be a 40% energy saving, as compared to 50% with the sails. And on top of the height problem, many European ports cannot accept ships with 60-metre beams. However, Maritime Propulsion believes that many of the doubts are about to be overwhelmed by how the ship would be powered. 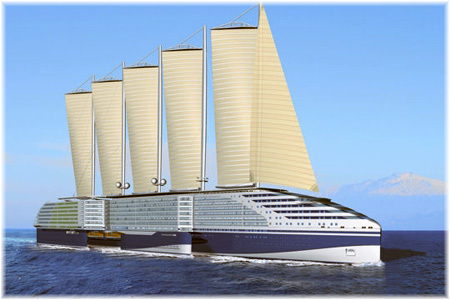 Her proposed fuel is Liquefied Natural Gas (LNG), which would power diesel-electric engines that would also work with six sails on five masts, with a sail area of 12,440 square metres, and solar panels mounted on the promenade decks surrounding her outer hull to generate electricity for hotel services. In winds above 30 knots, the Eoseas would even be able to proceed under sail alone. The big plus would be that her fuel consumption would be half that of a conventional cruise ship of the same size. CO2 emissions would also be reduced by half and Nitrogen Oxides by 90%, while no Sulphur Oxides would be generated at all. In all, energy costs would be cut by half and emissions by much more. Some of the other green attributes of the new vessel, in addition to the use of LNG, the sails and solar panels, include heat recuperation, a hull bubbler system that would smooth her way through the seas, water recycling and the use of recyclable materials in her furnishings. STX already has experience with LNG as a fuel, as its Lorient yard has built three LNG-powered ferries for Norway, and also in containing it, as it has built a number of large LNG carriers for Gaz de France at St Nazaire. The first LNG-powered ferry, the 1,651-ton Glutra, entered service in Norway, the world leader in the use of LNG as a fuel for ships, more than a decade ago, in January 2000. Several additional LNG-powered ferries have since been built for Norwegian owners, and three of these were built at Lorient. Much progress is now being made. Two weeks ago, the European Union announced that it would fund a study to examine the feasibility of developing LNG refuelling infrastructure for ships in Northern Europe. A week later, the Australian Government granted export finance funding for the world’s first dual fuel ferry, capable of operating on either LNG or diesel oil. 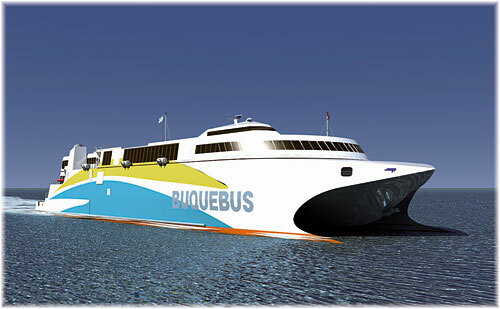 Incat will build the 100-metre ferry, which will enter service for Buquebus between Buenos Aires and Montevideo in October 2012. Further north, STX Finland is now building the world’s first LNG-powered cruise ferry for Viking Line, for delivery in early 2013. This €240 million 57,000-ton overnight cruise ferry will have 870 passenger cabins and carry 2,800 passengers. Intended for the Stockholm-Turku route, she will be the largest LNG-powered passenger-carrying ship in the world. Seeing as it was from Viking Line that Carnival Cruise Lines adopted its starboard-side only promenades with lounges to port, it will certainly not take long for this concept to cross the divide between ferries and cruise ships. And the same Turku shipyard that produced the Oasis and Allure of the Seas is building the new ship. What Maritime Propulsion pointed out in its coverage last week was that with the use of LNG coming closer as an alternative fuel, and the impending encroachment of Emissions Control Area (ECA’s) on shipping as a whole, this ship, or something like it, is now much more likely to be built within ten years than when it was first announced. Over in North America, the cruise industry generated 329,943 jobs that contributed $15.2 billion to the wage impact on the US economy in 2010, a 5.1% increase in employment and a 7% rise in wages over 2009. So says the latest independent study performed by BREA (Business Research & Economic Advisors) and commissioned by Cruise Lines International Association (CLIA). The report also revealed that the total cruise industry impact on the US was $37.85 billion of gross output, a 7% increase over 2009. Total direct expenditures with US-based businesses increased 5% to $18 billion. As a result of direct spending, the cruise industry generated 140,359 jobs with earnings of $5.84 billion at US businesses. In aggregate the direct employment and wage impacts increased by 4.4% and 6.5% respectively, over 2009. 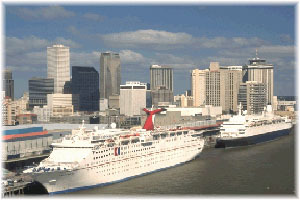 Economic benefits arise from spending by cruise line passengers and crew, shoreside staffing by cruise lines, expenditures by the lines for goods and services, spending by cruise lines at US ports; and expenditures by the lines in US shipyards, as well as capital expenditures for port terminals and office facilities. Florida, which accounts for 60% of all US embarkations, generated $6.3 billion in direct spending, helping to create 123,255 jobs paying $5.4 billion in income. California, with 10% of the cruise industry’s direct expenditure, was the beneficiary of $1.8 billion in spending and 41,697 jobs. New York, with a 32% increase in passengers and crew visits in 2010, accounted for 6.7% of direct expenditures, with the industry generating $1.2 billion in spending and creating 14,833 jobs. Florida’s pre-eminent position is largely due to having five cruise ports: Miami, Port Everglades, Port Canaveral, Tampa, and Jacksonville. That led a list of 15 embarkation ports that accounted for over 90% of US embarkations. 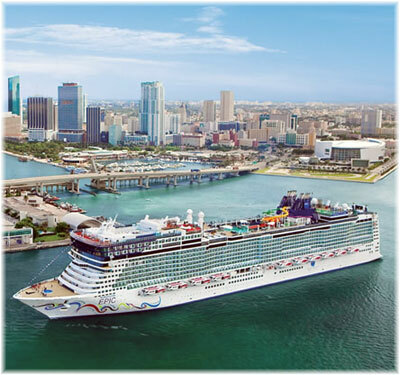 In order, the top ten ports are: Miami, Port Everglades, Port Canaveral, New York, Seattle, Galveston, Long Beach, Tampa, Los Angeles, New Orleans. 9,694,000 passengers boarded in US ports during 2010. CLIA member lines carried 14.8 million passengers in 2010, an increase of 10%, and the largest year-on-year jump since 2003, but rates are still below where they were before the recession. With the addition of nine new ships, CLIA lines increased lower berth capacity to 307,707 on 176 ocean-going ships, an 8.1% increase. Despite the capacity increase, CLIA member line ships still operated at 103.1% occupancy in 2010. In 2000, the North American cruise fleet totalled 111 ocean-going ships with 165,381 lower berths. By 2010, the fleet had increased by nearly 60%, with capacity growing by 86% as larger ships came into service. 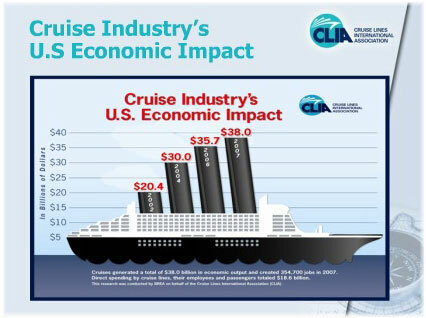 Spending with US businesses by the cruise industry in 2000 totalled an estimated $10.3 billion. This has increased by 75 percent to $18 billion in 2010. Over the same period, total economic output generated by cruise-related spending in the US increased by 125%, from $16.6 billion in 2000 to $37.9 billion in 2010. Total employment impact has increased 28.4% over the same period. With the implementation of the new North American ECA less than a year away (August 2012), the Atlantic Canada Cruising Association, St Lawrence Cruise Association and North West & Canada Cruise Association recently commissioned a study of the new ECA’s potential impact. Also produced by BREA, under the title of “Potential Impact of Low Sulphur Fuel requirements on Canada/New England and Alaska Cruise Itineraries,” it has tried to quantify this impact. The new ECA will require cruise ships operating within 200 miles of the North American coast to shift to low sulphur fuel with a maximum sulphur content of 1% by August 1, 2012, and 0.1% by 2015. This applies to all shipping, and not just to cruise ships. Among the study’s findings is that Canada/US itineraries will be at a competitive disadvantage compared to other itineraries that leave the North American ECA at the 200-mile limit and cruise to Bermuda or areas of the Caribbean. BREA has determined that fuel costs account for about 14% of total cruise line operating costs, and a fuel cost increase of 25% will thus produce a 3.5% rise in operating costs overall. It further concludes that, after implementation of the ECA, the cost increase of Canada/US cruises will be four times greater than those operating to Bermuda or the Western Caribbean, and ten times greater than an Eastern Mediterranean or Mexican Riviera cruise. Unless the regulations are amended prior to implementation, the loss resulting from the new North American ECA is estimated by BREA at something between 150,000 and 390,000 passengers. If a rigid regulatory approach were adopted, this would mean annual economic losses of up to $74 million and between 400 and 1,100 job losses. What is being sought to protect this business is a mix of flexibility in meeting performance standards, such as shore power, vessel exhaust scrubbers, fleet or vessel averaging of emissions, measures to avoid price gouging on low-sulphur fuels and the ability to negotiate on equivalency. More will be known after the next meeting of the Canadian Marine Advisory Council in November, by which time Transport Canada’s draft regulations should be available. Some good news from Canada is that Vancouver expects 200 cruise ship calls this year, up from 177 in 2010. But the equivalent number for 2009 was 256 and the Disney Wonder’s switch from Vancouver to Seattle in 2012 will mean the loss of seventeen of these cruises. The Disney Wonder’s last 2011 departure from Vancouver will be a 5-night cruise leaving on September 20 for Victoria, Ensenada and Los Angeles. She will return to Vancouver twice in 2012, however, once on a 7-night Los Angeles to Vancouver positioning voyage in May and again on a 6-night voyage from Vancouver to Los Angeles in September. Because she is not US-registered, US coasting laws prevent her from sailing directly between Los Angeles and Seattle. The Vancouver to Seattle and Seattle to Vancouver legs will then be sold as 7-night Alaska cruises. 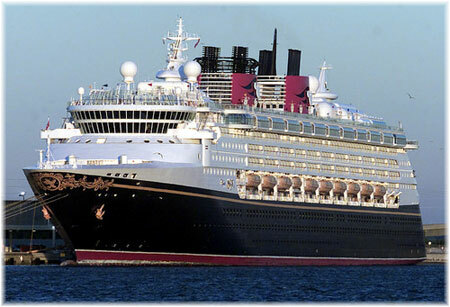 After the 2012 Alaska season, Disney Wonder will introduce an interesting new 7-night itinerary from Los Angeles that will include calls at San Francisco, San Diego and Ensenada, Mexico. Offering four of these cruises, this will be the first itinerary in some years to include all three ports in California, possibly even since the Los Angeles Steamship Company did so in the 1930s with the night boats Yale and Harvard.